Rat traps aren’t something that any of us ever wants to use but they are something that most of us have to use at least once in our lives. Rodent traps are one of the two best ways for dealing with an active rat infestation together with rat poisons. And a good rat trap is effective, efficient and reusable, and can serve you faithfully for years. Of course, even the best rat trap cannot deal with an entire rat nest on its own which is why we usually need to use multiple rat traps at once, why we need to mix rat traps from several different designs, or why we often need to use rat traps in conjunction with rat poisons. Figuring out which rat trap is right for your particular situation, as well as how to use, what other traps, poisons, and rat control tools to use it with, and so on, can be challenging, however. This is why we decided to make this article. Below, you will find a Top 3 list of the best rat traps on the market right now, an extended Top 10 list with 7 additional great products that you might want to consider , as well as a detailed guide on how to choose between all those items and how to best use them to their maximum effect. Why not start our best rat trap list with a humane live trap? More than just that, this Kensizer Humane Live Cage Trap for Rats is also one of the most effective rat trap options on the market right now. This metal rat traps option utilizes a lightweight aluminum structure that’s also sturdy and durable. Its fine wire mesh is almost guaranteed not to be chewed through by nether big rats nor small mice. If you are wondering how to trap a rat in a cage like this, the answer is that the cage does most of the work for you. This cage trap has a highly sensitive trigger mechanism that closes and locks the door behind the rodent as soon as the trigger mechanism is touched. If you fear that you might have problems with setting a rat trap then this one is for your – it comes assembled and is very easy to use – all you need to do is load some bait and place the trap on an active rodent route. With dimensions of 12.5 x 6.5 x 5 inches, this doesn’t really qualify as a large rat traps option but is more of a medium-sized product. 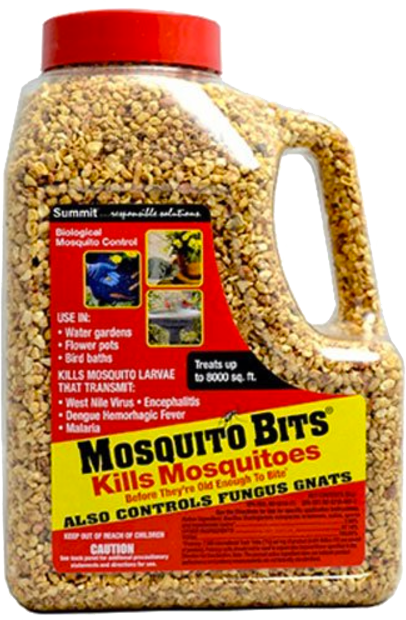 This makes it perfect for roof / black rats, as well as mice, squirrels, chipmunks, and other rodents. It can work with brown/Norway rats too, as long as they are not gigantic. Amidst the thousands of live commercial rat traps, this Kensizer Humane Live Cage Trap stands out like few others with its high quality. This metal, lightweight rat trap box cage by Kensizer is made out of high-quality materials and will be reusable for many successful captures. 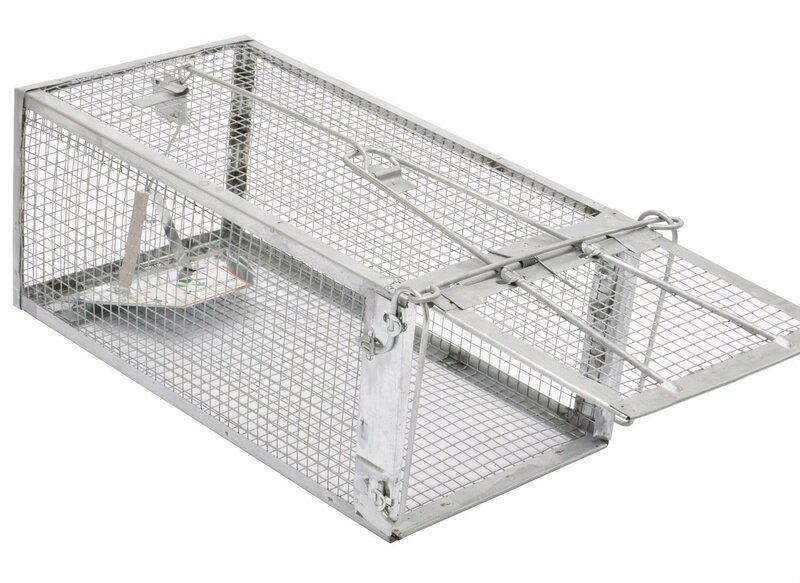 The high sensitive mechanism of this Kensizer humane live trap is one of the things that places it among the best rat traps on the market – it ensures that no rat or other rodents will be able to get out of the cage with the bait. The exclusive patented design of this Kensizer humane live cage trap is great both for its efficacy and for its simplicity and recognizable features. With dimensions of 12.5 by 6.5 by 5 inches, this trap is better suited for medium-sized and smaller rodents and may face difficulties with truly large rats. 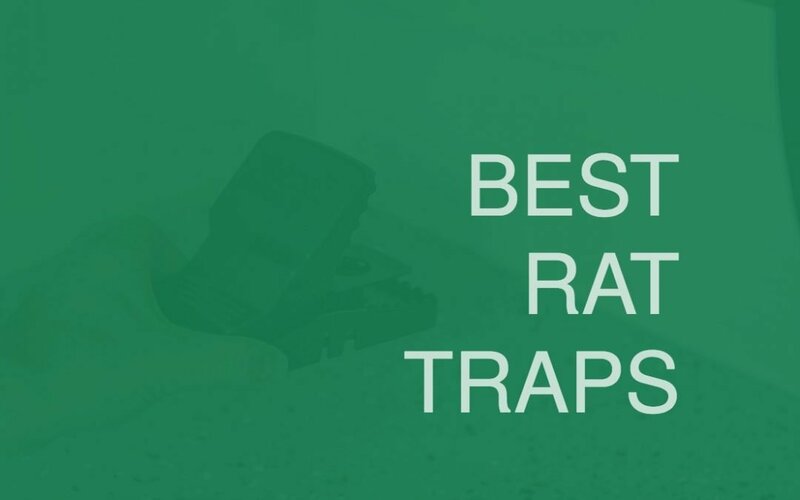 Most people have difficulties trusting a snap plastic rat trap but this AB Traps Pro-Quality rat snap trap is among the best rat trap options for a reason. Not only do they possess a sensitive and quick trigger mechanism, as well as high-speed snap, but they are also made out of durable and high-quality materials which make them a great long-term option. These reusable traps are almost guaranteed to retain their effectiveness over dozens of successful rat kills as long as they are handled and maintained properly. What’s more, if you are a novice trap hunter, this is also likely the best way to trap a rat for you thanks to the ease of its set up process. 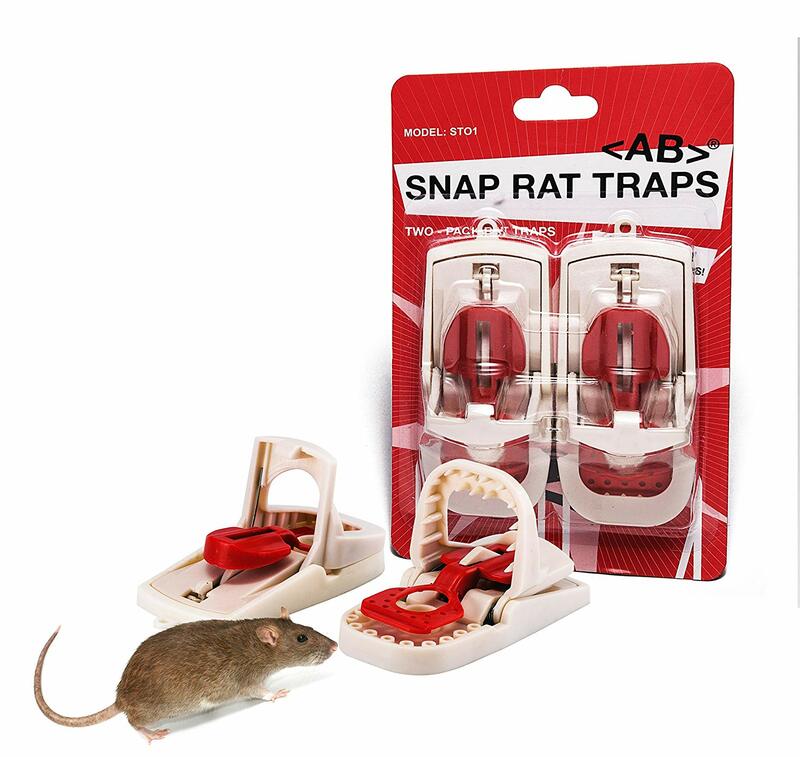 The complicated and tricky setup process is one of the general drawbacks of snap traps but this AB Traps Pro-Quality rat snap trap model has an EZ-Set Predator Snap Trap design that helps you set it up in seconds. 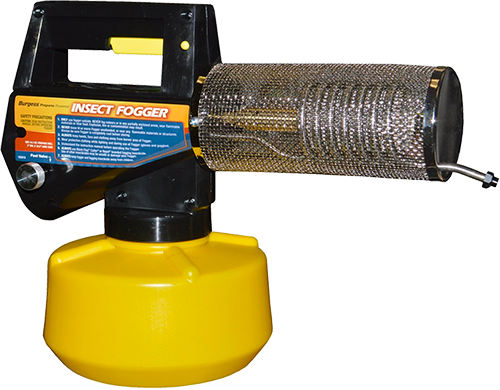 Tested for their quality and effectiveness, these snappers are great as roof rat traps or as mice traps but they may be too small for larger rodents like Norway rats. Still, if you are looking for lethal rat traps that work, this is a great option. This AB Traps Pro-Quality rat snap trap uses its EZ-Set Predator Snap Trap design which makes it very easy and safe to set up. Despite being a seemingly feeble plastic device, this rat trap is capable of quick and efficient kills and will last you a long time if used properly and against the right-sized rodents. AB Traps test their products extensively for quality and effectiveness which makes this Pro-Quality snapper a very efficient killer. The small size of this snap trap does mean that it is unsuitable for bigger and stronger animals such as Norway rats. A larger rodent is likely to not be killed instantly by the trap and to either manage to get away and/or damage the device. The third option on our Top 3 list is this Tomcat snap trap for rats and mice. This powerful snapper has a visibly aggressive design that lives up to its appearances. The interlocking teeth make escape practically impossible even if the rodent was large enough and strong enough to survive the initial snap. The bait cup and trigger mechanism are sensitive and quick to trigger too, so you are not likely to see many missing baits from cunning and quick rodents. What’s more, the bait cup itself is removable so you can also use it as bait on its own. This big rat traps option is large enough to snap the necks of even the largest and strongest rats you might encounter. The trap is also relatively easy to set up and can be placed and loaded by hand and by foot. This Tomcat rat snap trap offers Tomcat’s signature quality – it’s made out of strong and sturdy materials that will last you for multiple catches. The design of this rat snapper is also an example of Tomcat’s quality – the interlocking teeth on this trap make sure that any rat that survives the initial snap will be locked in the trap and have no way to escape. The trigger mechanism on this rat snapper is sensitive enough to trigger easily and not allow for any crafty mice or rats to get away with the bait. The bait cup is removable which means that you can also use it separately from the trap for just baiting. The size of the trap makes it ideal for larger rodents and less practical for smaller mice. It will still trigger off of them and snap them, but it may not hit their necks and can sometimes miss. The inescapable design of the interlocking teeth is great in that it prevents any escape attempts by survivors, but it also turns this snapper into a potential torture device. Rats that have been unlucky enough to survive the initial snap are often observed struggling to get out of the jaws for hours until they eventually die of exhaustion or by breaking their own necks. The question “How to set a rat trap?” is very easy to answer with this Havahart Rat Trap. It has a classic cage live trap design, large dimensions of 16 by 6 by 6 inches, the 12-Gauge wire mesh is made out of galvanized steel, and it has a quick gravity action door, plus it also comes fully assembled and ready to use. One major drawback of this trap is that the locking mechanism is accessible for the captured rodents to break. This Victor Snap Trap has a classic design and has stood the test of time. 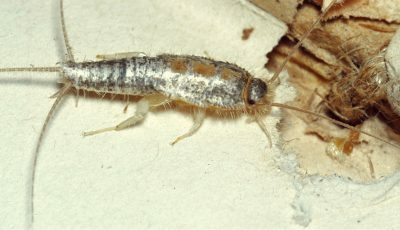 The trap comes pre-baited with a scented, expanded trigger. The trap is easy to set up and effective in its work. 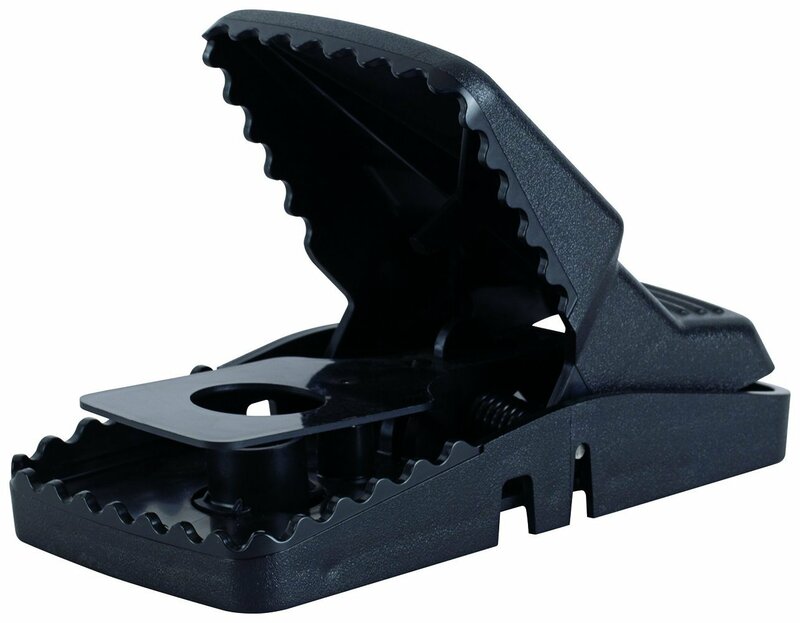 The classic design does miss out on some possible improvements, however, that other modern snap traps have made – it has no teeth to hold the rodent down should it survive, plus it doesn’t have a pedal to make it safer to set up with your foot. The first and only electronic zapper trap on our list, the Abco Tech Humane Rodent Zapper does have a lot to offer. With its 7000 v of power, it is as “humane” as an electronic rat trap can get and will kill most rodents almost instantly. It’s intended mostly for indoor use, however, and as all electronic rat traps, it requires extensive cleaning after each kill. Another nice humane live cage rat trap is this Trapro Humane Rat Trap. This item has dimensions of 10.5 by 5.5 by 4.5 inches, which is also its main drawback – it’s just not big enough for large rats. It does, however, has a sturdy design, a sensitive trigger, and a secure door, so it’s a great option for smaller rats or other rodents. This KChoies Mouse Glue Trap consists of several extra large leather stripes, all drenched in a strong adhesive. The giant size of the stripes allows for multiple large rats to be caught at once, as well as for easy disposal of dead rats by simply cutting pieces of leather off of the main stripe. Aside from the standard drawback of all glue traps – that they are among the most horrific torture devices ever thought out by a man – there is also the additional drawback that these leather stripes can be tricky to set up by a single person. This Kat Sense Snap Trap impresses with its size. It has a sleek and simple to use design and its sensitive trigger mechanism ensures that no rat will manage to step on the trap without triggering it. Subsequently, this is also the drawback of this trap as it can sometimes be too sensitive and trigger too easily, particularly before the rat is in position. Goodnature Automatic Rat Trap makes the question of “What to put in a rat trap?” redundant as their rat-trap comes with its own unique bait. More importantly, it also has a truly unique design in which the rodent’s head is rammed with a spring-powered hammer as it tries to sniff the bait. The hammer than automatically resets and the rodent’s corpse drops below the trap where it can be picked up either by you or by wildlife animals as prey. The one major flaw in this otherwise awesome design is that should the hammer not manage to kill the rodent, then it will be free to leave. This is one of the more popular and also most humane options when it comes to capturing rats. Live cage traps can utilize several different trigger mechanisms but they all work on the same principle – you place the bait inside the trap on a special plate. The plate is sensitive to any and all motions so whenever someone touches the bait the plate triggers a spring or another locking mechanism that shuts the gate behind the rodent’s back. Such live cage traps can be made out of wire mesh or from any other material but they need to be sturdy and be able to survive excessive chewing since captured rats will do anything they can to get out. It also helps if the locking mechanism is situated out of the captured animal’s reach so that it doesn’t get damaged. Captured rats can damage the locking or trigger mechanisms and render the trap unusable for future occasions. If you leave a rat in the cage for too long other rats around him will figure out that getting inside the cage is a bad idea and will avoid the trap from then on, thus rendering it less useful. Another popular live trap option, bucket traps come in different models and designs, but they all work on the same idea – bait the rats to come to the edge of a big bucket then force them to fall inside the bucket and make sure that they can’t leave it. The most popular designs are roller traps that are made out of metal or plastic rolls laid over the bucket from which the rats will drop inside but there are other variants too. The advantage of such traps is that they are self-resetting and can capture multiple rats at once. Their main disadvantage is that if the rats are too big or too numerous or if the bucket is too small, the rats might be able to get out of it. Another chief problem with both live bucket and cage traps is that you’ll have to find a suitable way to deal with the captured animal, usually by transporting it away from your property into an unpopulated area. On to some lethal options, snap spring rat traps are the most well-known and classic type of rat traps. Similar to live cage traps they work by placing the bait on a trigger plate. However, once the plate has been triggered, instead of shutting a door behind the rat, the trap shuts a metal rod over the rat’s neck, usually breaking it instantly. These traps are considered a relatively “humane” option as they often kill the rodents instantly, but if the trap is not big enough or strong enough it may not do so. A lot of snap traps have interlocking jaws on their snapping tools to make sure that the prey won’t be able to get away should it survive the initial trap. This increases the traps’ effectiveness but also turns them into more of a “capture and torture” kind of trap than an instant-kill “humane” one. Zappers are another type of traps that are supposed to kill rats instantly. They resemble cages but when a rat gets inside there is no door behind them that can capture them inside. Instead, zappers deliver powerful electric shocks to the animals inside of them with the intention of killing them instantly. When it works, this can be a relatively “humane” way to kill a rodent, but very often the electric shock is weaker than advertised and doesn’t instantly kill the animals (especially bigger and stronger rats). This can result either in a successful escape or in a slow and horrifying death. There are plenty of cases where the rats get slowly fried for several minutes until they eventually die in an agonizing way. Needless to say, even if you don’t care how the rats die, zapper traps need some extensive cleaning after each killed rat. Die from dehydration if you leave them there for long enough. Needless to say, it’s clear why glue traps are largely regarded as the most horrific ways to hunt rodents. Still, if you are looking for effectiveness and effectiveness only, they are an option. Finding the right rat trap isn’t a complicated process but it is a time-consuming one. Since you want to find the most effective tool for your situation, it’s smart to invest a good amount of time in it to make sure that you’ll get what you need. The first and foremost thing to consider is the quality of the trap. It almost doesn’t matter what design or model you are going to choose if it is of poor quality. Of course, every manufacturer claims to offer high-quality products so you’ll, unfortunately, have to rely on consumer reviews and industry professional reviews. Both types have their drawbacks and biases but if you read enough of them you will start to get a clear picture of what’s worth buying and what – not so much. Another thing to keep an eye on when it comes to quality is the products’ brands. Branding is not a sure-fire way to judge quality but it’s a thing to consider. Here are some of the brands we’d recommend: Havahart, Tomcat, Goodnature among others. Do you want to capture rats in a humane manner instead of killing them? Consider a live cage or bucket trap. Do you want to kill rats in a quick and easy fashion? The classic snap traps are a good option. Do you want to get rid of large numbers of rats at once with no care for how gross or hard-to-look at it might get? Big glue traps have that potential. Rat traps only work if the rats get inside of them and for that to happen, you’ll need a good bait. Fortunately, rats are omnivores so they eat just about anything. Unfortunately, rats are very smart and cautious animals so they are unlikely to get inside a large metal cage for something small and unappealing. The bait you use should be something that’s high on protein and that has a nice, attractive smell to it. A lot of rat traps come pre-baited but we’d honestly advise you to find a good food bait on your own even if that’s the case. Also, keep in mind that different types of rats have different dietary preferences. Norway (brown) rats prefer different things than Roof (black) rats, even though both types are still omnivores and can eat anything. So, if you know what you’re dealing with, you’ll do better to customize your baits according to your situation. To find out what type of rat you’re dealing with you can use night vision cameras or simply refer to our articles on the different types of rats for more clues and tips. Properly using rat traps – almost regardless of their type and design – is all about finding the right location. It doesn’t matter how well you’ve baited a rat trap if it is located away from the travel routes of your rat invaders they may never get inside of it. 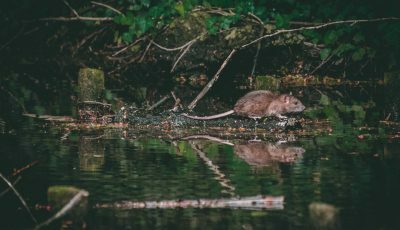 So, before setting up your traps, it’s a good idea to carefully figure out where exactly do your rats move through – where are their nests, where are their feeding locations, and how do they traverse between one and the other. Night vision cameras, non-toxic biomarker rat baits, as well as simply looking for scratch and claw marks or for rat droppings are all good ways of determining where you should set your traps. If you’re still not sure about the right locations, another good option is to just purchase more traps and set them up everywhere. 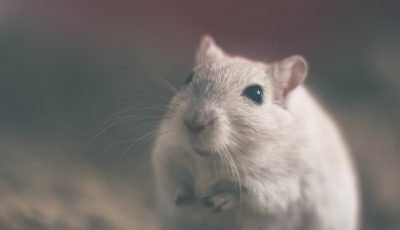 Rats are not as curious as mice so they tend to keep their own travel routes and not explore too much if they don’t need to. Rats are also more cautious to new things than mice, so expect them to keep away from rat traps at first. In fact, it is a smart idea to first leave baited but inactive traps to gain the rodents’ trust and to start setting up the active traps in a day or two. Aside from that, other good tips for rat control is to keep your property well-sanitized as you’re dealing with the rat infestation – the more dirt, food leftovers and other “rat attractants” there are, the less interested will the rats be in your baits and traps. Another good thing to do is to seal off and maintain your property as you don’t want more rodent invaders coming in from the outside while you’re dealing with the ones that have already gotten through. Lastly, almost regardless of what type of trap you’re using, remember to check up on them frequently. Dealing with killed or captured rats as soon as possible is important not only for “humane” reasons but also so that the other rats don’t notice and figure out the danger of the traps. Rats are incredibly intelligent creatures so if they see another captured or killed rat they can quickly understand what has happened and that they should avoid your future traps. This is also a good reason to consider using multiple different rat trap designs at once, as well as using a combination of rat traps and rat poisons. As you can see, the diversity in rat traps is almost as great as the diversity among rats. There are all kinds of designs, shapes, and sizes that rat traps can be made of, each better suited for different situations and intentions. Choosing the perfect rat trap for your situation can be time-consuming and challenging but suffice it to say that there is a perfect rat trap for any situation. That’s why it’s so important to research carefully before making your choice and why we decided to make this article in the first place. This Kensizer Humane Live Cage Trap has all the hallmarks of a great cage trap – good quality materials, great wire mesh, perfect design, sensitive trigger mechanism, and fast door action. It’s large enough for most rats and it is very easy to use. AB Traps Rat Snapper with a great EZ-Set Predator Snap Trap design that makes it very easy to set up. This trap also has a very fast snap and a deceptively strong bite, despite its plastic body. It’s not as big as other snap traps but if it’s big enough for your rodent invaders then it’s defiantly recommended. This Tomcat Rat Snap Trap is different than the AB Traps snap trap both in size and in design – it’s significantly larger and has a much more defined jaws that serve to keep the rodent trapped even if it has survived. With this trap, even the biggest and strongest rats will either be killed or trapped, with no exceptions.